Freedom’s Just Another Word is a gripping examination of the delicate terrain inside a child’s mind and emotions while suffering horrendous child abuse as well as the lasting effects on the personality and feelings on an adult survivor of these situations. In this riveting book, author Dan L. Hays depicts an inner journey that begins with the slow unveiling of memories that rise to the surface after suffering numerous losses. These losses included the death of his abusive alcoholic father and repetitive job losses added to deeply embedded insecurities. These previously buried memories began to surface as a result of numerous traumatic episodes (both physical and emotional) at the hands of his father, coupled with the passive presence of an alcoholic mother. As Mr. Hays painstakingly uncovered the memories, bit by bit, via flashbacks of conversations and myriad personal incidents, an inner journey of breakthroughs gained momentum—like an unstoppable freight train with very little traction left in the brake system. During one particularly disturbing flashback, author Hays recalled an incident that began over a normal disagreement between a young man and his dad. During the height of popularity of rock and roll when the British group The Beatles came to the U.S., young men were letting their hair grow long to emulate the world-famous rock stars. His father was adamant about his son’s full surrender to getting a haircut. Later that night after the argument, while Mr. Hays was fast asleep, his father entered his son’s bedroom, reeking of bourbon, and began shouting. As his helpless young son recalled in the book “He began hitting me with his open hand, along the ribs, hitting, hitting, hitting while I covered up as best I could, curled up in a ball.” This is but one of many tragic incidents that author Hays endured in his youth. Similar to unpeeling the layers of an onion, Mr. Hays both encouraged and feared the emotional rollercoaster that ensued over the next few years. He never gave up his personal struggle to gain a sense of self esteem and freedom even though he endured bouts of severe depression, suicidal thoughts, debilitating fear, and later his own battle with alcoholism. Prior to his father’s death, Mr. Hays was able to reconcile and reconnect with his alcoholic father as two adults who had much to mend in a broken relationship between a father and son. This poignant piece of the author’s journey is a bird’s eyeview into the struggle to overcome unresolved inner demons created by a dysfunctional family and then incorporated by the now adult child. The title of the book was carefully chosen from the words of a song that delineated a literal battle to the death with drugs and alcohol, performed by the famed 1960s singer/ songwriter Janis Joplin. Her original words “Freedom’s Just Another Word for Nothing Left to Lose” from Ms. Joplin’s heart wrenching melody, are brought to life again through Mr. Hays’s gifted writing style and poetic prose. This memoir is larger than one man’s story. The depth of Mr. Hays’s journey ran the gamut of rage, alcoholism and near death to a dramatic recovery—an emotional and spiritual resurrection, that is reminiscent of a metaphorical Rise of the Phoenix from the proverbial ashes. 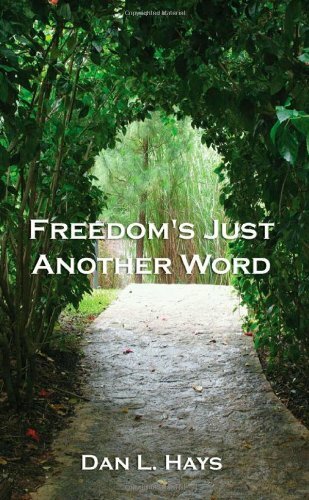 While Freedom’s Just Another Word is a powerful book dealing with the critical issue of child abuse, it may not appeal to some readers who might have a very difficult time with the topic in and of itself. Due to the sometimes graphic nature of the incidents of emotional as well as physical abuse, people who are struggling with the issue in their own lives might feel very uncomfortable while reading the darker passages in the book. Though this could be a potential drawback of Freedom’s Just Another Word, it certainly does not detract from Mr. Hays’s incredible journey to freedom and serenity. The emotions expressed so eloquently along with the fortitude and courage of his struggle, this book would be a welcome addition to the libraries of many people who have struggled with child abuse, the professionals that help them heal, and others across this country—and perhaps the world. Laura Schultz is a freelance writer and President of Counseling at Your Service in Los Angeles. She has been a licensed Marriage and Family Therapist for over 25 years and a life coach specializing in sexuality, addiction and childhood trauma. She has published articles in several national magazines on sexuality, relationships and communication, spirituality, and health and wellness topics. She has also extensively researched serial killers and sociopaths.